A) The main motor adopts imported converter to adjust the speed in a stepless way. B) Unwinding and rewinding are controlled through magnetic powder brake and clutch. It uses Japanese Mitsubishi tension controller to control the tension of the machine to ensure stable tension and precise overlapping. 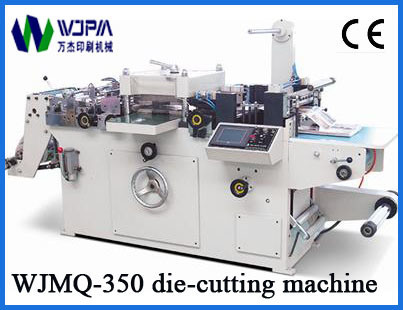 C) The machine is equipped with ceramic rollers for inking with the features of stable inking, no color difference, long life span, wear and tear endurance, anti corrosion which will also increase the print quality and efficiency. D) The printing unit can register in 360 degrees at longitudinal direction and do lateral adjustment as well which greatly shorten the pre-print time and reduces the material waste. E). Each printing unit is equipped with one infrared drier to dry the print right after it is printed. F) The inking roller can automatically fall off at stoppage and run at low speed in order to keep the ink from being dry and solid. G) Unwinding, printing, vanishing, drying, laminating and rewinding of roll material can be done in one process. It is characterized by wide application, no ink population, fast dry and quick print. It is an ideal printing machine for the commercial bill, board and high-grade adhesive label. H) It is also optional for the machine to be equipped with UV unit, web-guide and corona Unit.